The Closed season is here and the FC fans are as mixed up as ever!! Yesterday, half way through the first half, I looked round and lamented the empty seats that denoted those of you who decided to sit in the garden and give it a miss, having no doubt concluded for this season at least, enough was enough! That made me think of a famous catch phrase of good old David Doyle-Davidson when he used to say, “You’re missing nothing”. Boy was that true yesterday! I wouldn’t worry about it at all however, because why should you turn up when the team consistently fail to! I know it was the last game and a dead rubber once again, but it would have been nice to have something to enthuse about. Lee Radford described it as a ‘Gallant defeat’ but for most of us it was just ‘same old’ really, bags of effort but a lack of skills, mental tenacity and organisation. Over 30 games played and some of ‘em still can’t catch a ball! 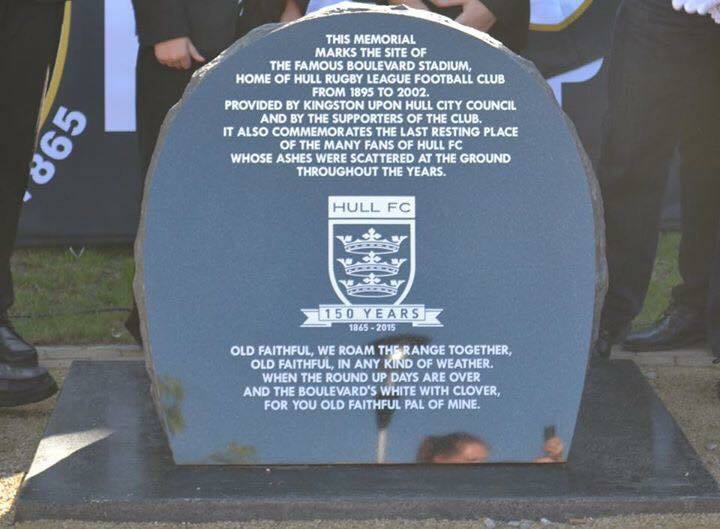 The Boulevard Memorial unveiled on Saturday, a gift from the fans of Hull FC today, to the fans and community of the future! Well we didn’t win, but in the end how can you possibly ask for any more than that?? I was expecting at least a 50-0 thumping, but apparently we don’t do those do we? That said, in all seriousness I was expecting a real drubbing at Wigan on Friday and you really do have to give those kids and the handful of senior professionals that were fit, a real pat on the back. Losing both Lineham and Shaul were two massive blows, but the youngsters regrouped brilliantly and came through and please forgive me for once again saying it, but why the hell are we merging all that brilliant talent and future prospect with Rovers? 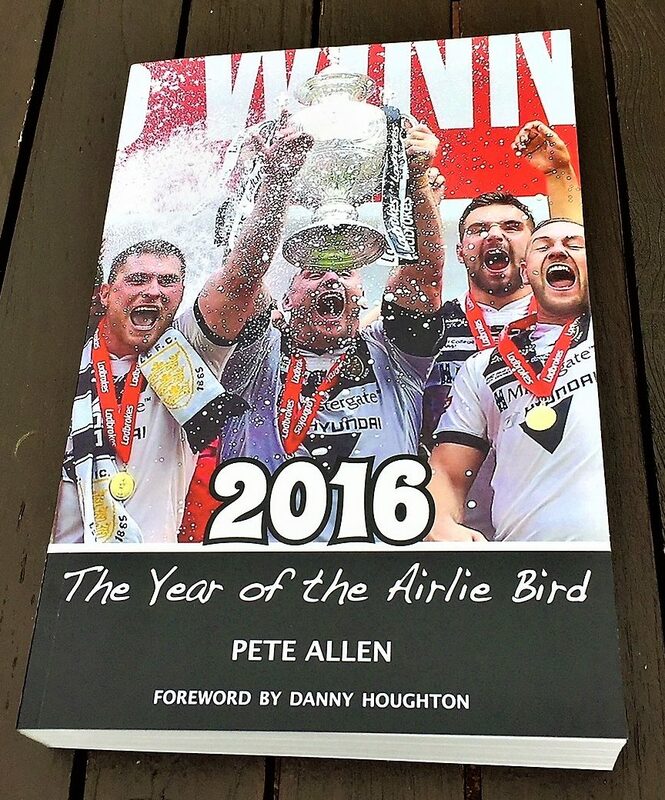 What exactly is wrong with the Hull FC academy which at last seems to be producing a production line of talent? Friday’s was a performance that was the stuff memories are made of, as our youngest team for years almost pulled off a fairytale ending in a game in which we all thought we’d get stuffed!! Yet the young lads stepped up and the senior players came good. It was the sort of performance that makes up for some of the bad times we have endured this term and by the end I was so, so proud of the guys that Richard Horne (in exactly one year since he last pulled on the FC jersey) has brought to the verge of the first team. They were all terrific, indeed the senior players were simply amazing as well, during what was a great and proud night to be an FC fan. I am one who rarely celebrates failure, but who also believes that when you are passionately committed to a cause, you should at times at least give a nod in the direction of hope. You always want to win, of course you do, but that’s sort of passion and wanting is what I want to see when I watch a Hull team and in fact that’s the sort of energy and effort we have seen for much of the season in the Under 19’s, where often an under strength 17 have battled and battled to the very end and usually come through. Cometh the hour cometh the heroes and for me everyone who pulled on a shirt last Friday was just that, we lost, but by just 6 points, however it could so easily have been the real pasting that the media, many at the Club, most of the fans and this very ordinary blogger had predicted and indeed feared. It’s hard to report it but if you weren’t there, I’m afraid yesterday’s game can only be described as a pretty aimless shambles. Decimated by injury all we could probably hope for was some spirit and effort but on both counts we were sadly lacking. The Under 19’s had shown those qualities in abundance in an epic victory 24 hours earlier, but as for their senior counterparts, well they couldn’t be arsed and quite frankly yesterday was nothing short of embarrassing!! I hate being negative in here but there’s little else I can say really! That said it’s also pretty obvious that the new ’split’ system isn’t working for everyone either, because ‘every minute’ really doesn’t count; well it doesn’t when you’re in our position and indeed that of Warrington, when with 4 games to go neither team had anything much to play for! OK the Wire needed to restore some pride after some poor performances, but the game was more like a pre-season friendly than a Super 8’s encounter and it was obvious to me that both sets of fans were bored with it all long before the end. Hull FC simply didn’t turn up, while in all honesty Warrington weren’t that much better either! Our performance was poor, but if it did one thing for me then it re-affirmed how we must have the best and longest suffering fans in the game, for despite what was served up on the field, off it the fans were great. The atmosphere on the away terrace was first class and the Hull contingent of around 700 out-sang the home support throughout and that despite having to watch what was little short of a turgid display. It was certainly real end of season stuff and for us fans travelling over there on a two hour journey, through miles of 50 mile an hour restrictions, pretty soul destroying too, because any sort of reward for our efforts was none existent. What worries me as well is that despite new faces coming in next season, it’s hard to see that much will improve, as accepting mediocrity seems to be a culture at the Club and a culture that’s wearing very thin with a lot of us fans. 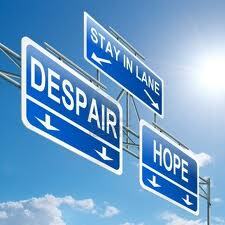 Still its ONLY Wigan on Friday and another long haul when it’s hard to see anything but another defeat! I don’t know about you but I can’t wait for the season to be over now and what’s more it looks to me as if the players feel that way too! !